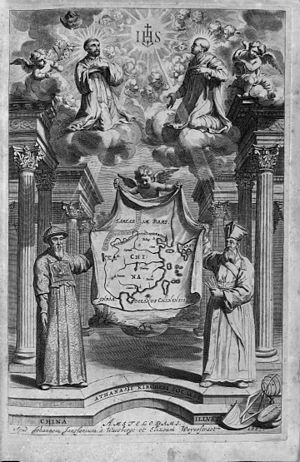 The frontispiece of Athanasius Kircher's 1667 China Illustrata, depicting the Jesuit founders Francis Xavier and Ignatius of Loyola adoring the monogram of Christ in Heaven while Johann Adam Schall von Bell and Matteo Ricci labor on the China mission. Nicolas Trigault (1577–1629) in Chinese attire, by Peter Paul Rubens. 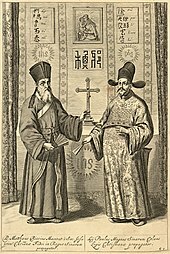 Matteo Ricci (left) and Xu Guangqi (right) in the Chinese edition of Euclid's Elements published in 1607. Contacts between Europe and the East already dated back hundreds of years, especially between the Papacy and the Mongol Empire in the 13th century. Numerous traders – most famously Marco Polo – had traveled between eastern and western Eurasia. Christianity was not new to the Mongols, as many had practiced Christianity of the Church of the East since the 7th century (see Christianity among the Mongols). However, the overthrow of the Mongol Yuan Dynasty by the Ming in 1368 resulted in a strong assimilatory pressure on China's Muslim, Jewish, and Christian communities, and outside influences were forced out of China. By the 16th century, there is no reliable information about any practicing Christians remaining in China. 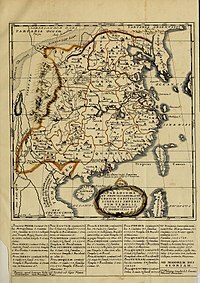 Fairly soon after the establishment of the direct European maritime contact with China (1513) and the creation of the Society of Jesus (1540), at least some Chinese became involved with the Jesuit effort. As early as 1546, two Chinese boys enrolled in the Jesuits' St. Paul's College in Goa, the capital of Portuguese India. One of these two Christian Chinese, known as Antonio, accompanied St. Francis Xavier, a co-founder of the Society of Jesus, when he decided to start missionary work in China. However, Xavier failed to find a way to enter the Chinese mainland, and died in 1552 on Shangchuan island off the coast of Guangdong, the only place in China where Europeans were allowed to stay at the time, but only for seasonal trade. A few years after Xavier's death, the Portuguese were allowed to establish Macau, a semi-permanent settlement on the mainland which was about 100 km closer to the Pearl River Delta than Shangchuan Island. A number of Jesuits visited the place (as well as the main Chinese port in the region, Guangzhou) on occasion, and in 1563 the Order permanently established its settlement in the small Portuguese colony. However, the early Macau Jesuits did not learn Chinese, and their missionary work could reach only the very small number of Chinese people in Macau who spoke Portuguese. A new regional manager ("Visitor") of the order, Alessandro Valignano, on his visit to Macau in 1578–1579 realized that Jesuits weren't going to get far in China without a sound grounding in the language and culture of the country. He founded St. Paul Jesuit College (Macau) and requested the Order's superiors in Goa to send a suitably talented person to Macau to start the study of Chinese. Accordingly, in 1579 the Italian Michele Ruggieri (1543–1607) was sent to Macau, and in 1582 he was joined at his task by another Italian, Matteo Ricci (1552–1610). Both Ricci and Ruggieri were determined to adapt to the religious qualities of the Chinese: Ruggieri to the common people, in whom Buddhist and Taoist elements predominated, and Ricci to the educated classes, where Confucianism prevailed. Ricci, who arrived at the age of 30 and spent the rest of his life in China, wrote to the Jesuit houses in Europe and called for priests – men who would not only be "good", but also "men of talent, since we are dealing here with a people both intelligent and learned." The Spaniard Diego de Pantoja and the Italian Sabatino de Ursis were some of these talented men who joined Ricci in his venture. Just as Ricci spent his life in China, others of his followers did the same. This level of commitment was necessitated by logistical reasons: Travel from Europe to China took many months, and sometimes years; and learning the country's language and culture was even more time-consuming. When a Jesuit from China did travel back to Europe, he typically did it as a representative ("procurator") of the China Mission, entrusted with the task of recruiting more Jesuit priests to come to China, ensuring continued support for the Mission from the Church's central authorities, and creating favorable publicity for the Mission and its policies by publishing both scholarly and popular literature about China and Jesuits. One time the Chongzhen Emperor was nearly converted to Christianity and broke his idols. The fall of the Ming Dynasty (1644) and the conquest of China by the Manchu Qing regime brought some difficult years for the Jesuits in China. While some Jesuit fathers managed to impress Manchu commanders with a display of western science or ecclesiastical finery and to be politely invited to join the new order (as did Johann Adam Schall von Bell in Beijing in 1644, or Martino Martini in Wenzhou ca. 1645–46), others endured imprisonment and privations, as did Lodovico Buglio and Gabriel de Magalhães in Sichuan in 1647–48 or Alvaro Semedo in Canton in 1649. Later, Johann Grueber was in Beijing between 1656 and 1661. The Chinese Jesuit Michael Alphonsius Shen Fu-Tsung visited France and Britain in 1684–1685. "The Chinese Convert" by Sir Godfrey Kneller. During the several years of war between the newly established Qing and the Ming loyalists in southern China, it was not uncommon for some Jesuits to find themselves on different sides of the front lines: while Adam Schall was an important counselor of the Qing Shunzhi Emperor in Beijing, Michał Boym travelled from the jungles of south-western China to Rome, carrying the plea of help from the court of the last Southern Ming emperor Zhu Youlang (the Yongli Emperor), and returned with the Pope's response that promised prayer, after some military assistance from Macau. There were many Christians in the court of the polygamist emperor. In 1685, the French king Louis XIV sent a mission of five Jesuit "mathematicians" to China in an attempt to break the Portuguese predominance: Jean de Fontaney (1643–1710), Joachim Bouvet(1656–1730), Jean-François Gerbillon (1654–1707), Louis Le Comte (1655–1728) and Claude de Visdelou (1656–1737). French Jesuits played a crucial role in disseminating accurate information about China in Europe. Prior to the Jesuits, there had already been Chinese pilgrims who had made the journey westward, with two notable examples being Rabban bar Sauma and his younger companion who became Patriarch Mar Yaballaha III, in the 13th century. While not too many 17th-century Jesuits ever went back from China to Europe, it was not uncommon for those who did to be accompanied by young Chinese Christians. One of the earliest Chinese travelers to Europe was Andreas Zheng (郑安德勒; Wade-Giles: Cheng An-te-lo), who was sent to Rome by the Yongli court along with Michał Boym in the late 1650s. Zheng and Boym stayed in Venice and Rome in 1652–55. Zheng worked with Boym on the transcription and translation of the Nestorian Monument, and returned to Asia with Boym, whom he buried when the Jesuit died near the Vietnam-China border. A few years later, another Chinese traveller who was called Matthaeus Sina in Latin (not positively identified, but possibly the person who traveled from China to Europe overland with Johann Grueber) also worked on the same Nestorian inscription. The result of their work was published by Athanasius Kircher in 1667 in the China Illustrata, and was the first significant Chinese text ever published in Europe. Better known is the European trip of Shen Fo-tsung in 1684–1685, who was presented to king Louis XIV on September 15, 1684, and also met with king James II, becoming the first recorded instance of a Chinese man visiting Britain. The king was so delighted by this visit that he had his portrait made hung in his own bedroom. Later, another Chinese Jesuit Arcadio Huang would also visit France, and was an early pioneer in the teaching of the Chinese language in France, in 1715. 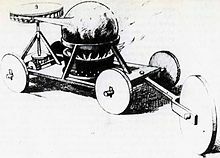 The steam engine manufactured by Ferdinand Verbiest at the Qing Court in 1672. Jan Mikołaj Smogulecki (1610–1656) is credited with introducing logarithms to China, while Sabatino de Ursis (1575–1620) worked with Matteo Ricci on the Chinese translation of Euclid's Elements, published books in Chinese on Western hydraulics, and by predicting an eclipse which Chinese astronomers had not anticipated, opened the door to the reworking of the Chinese calendar using Western calculation techniques. This influence spread to Korea as well, with João Rodrigues providing the Korean mandarin Jeong Duwon astronomical, mathematical, and religious works in the early 1630s which he carried back to Seoul from Dengzhou and Beijing, prompting local controversy and discussion decades before the first foreign scholars were permitted to enter the country. Like the Chinese, the Koreans were most interested in practical technology with martial applications (such as Rodrigues's telescope) and the possibility of improving the calendar with its associated religious festivals. Johann Adam Schall (1591–1666), a German Jesuit missionary to China, organized successful missionary work and became the trusted counselor of the Shunzhi Emperor of the Qing Dynasty. He was created a mandarin and held an important post in connection with the mathematical school, contributing to astronomical studies and the development of the Chinese calendar. Thanks to Schall, the motions of both the sun and moon began to be calculated with sinusoids in the 1645 Shíxiàn calendar (時憲書, Book of the Conformity of Time). His position enabled him to procure from the emperor permission for the Jesuits to build churches and to preach throughout the country. The Shunzhi Emperor, however, died in 1661, and Schall's circumstances at once changed. He was imprisoned and condemned to slow slicing death. After an earthquake and the dowager's objection the sentence was not carried out, but he died after his release owing to the privations he had endured. A collection of his manuscripts remains and was deposited in the Vatican Library. After he and Ferdinand Verbiest won the tests against Chinese and Islamic calendar scholars, the court adapted the western calendar only. The Beitang Church was established in Beijing by the Jesuits in 1703. A page from Mémoires concernant l'histoire, les sciences et les arts des Chinois, 1780. The Jesuits also endeavoured to build churches and demonstrate Western architectural styles. In 1605, they established the Nantang (Southern) Church and in 1655 the Dongtang (Eastern) Church. In 1703 they established the Beitang (Northern) Church near Zhongnanhai (opposite the former Beijing Library), on land given to the Jesuits by the Kangxi Emperor of the Qing Dynasty in 1694, following his recovery from illness thanks to medical expertise of Fathers Jean-François Gerbillon and Joachim Bouvet. Latin spoken by the Jesuits was used to mediate between the Qing and Russia. A Latin copy of the Treaty of Nerchinsk was written by Jesuits. Latin was one of the things which were taught by the Jesuits. A school was established by them for this purpose. A diplomatic delegation found a local who composed a letter in fluent Latin. Confucius, Philosopher of the Chinese, or, Chinese Knowledge Explained in Latin, an introduction to Chinese history and philosophy published at Paris in 1687 by a team of Jesuits working under Philippe Couplet. The Jesuits were also very active in transmitting Chinese knowledge to Europe, such as translating Confucius's works into European languages. Ricci in his De Christiana expeditione apud Sinas had already started to report on the thoughts of Confucius; he (and, earlier, Michele Ruggieri) made attempts at translating the Four Books, the standard introduction into the Confucian canon. 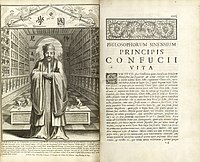 The work on the Confucian classics by several generations of Jesuits culminated with Fathers Philippe Couplet, Prospero Intorcetta, Christian Herdtrich, and François de Rougemont publishing Confucius Sinarum Philosophus ("Confucius, the Philosopher of the Chinese") in Paris in 1687. The book contained an annotated Latin translation of three of the Four Books and a biography of Confucius. It is thought that such works had considerable importance on European thinkers of the period, particularly those who were interested in the integration of the Confucian system of morality into Christianity. Since the mid-17th century, detailed Jesuit accounts of the Eight trigrams and the Yin/Yang principles appeared in Europe, quickly drawing the attention of European philosophers such as Leibniz. Chinese linguistics, sciences, and technologies were also reported to the West by Jesuits. Polish Michal Boym authored the first published Chinese dictionaries for European languages, both of which were published posthumously: the first, a Chinese–Latin dictionary, was published in 1667, and the second, a Chinese–French dictionary, was published in 1670. The Portuguese Jesuit João Rodrigues, previously the personal translator of the Japanese leaders Hideyoshi Toyotomi and Tokugawa Ieyasu, published a terser and clearer edition of his Japanese grammar from Macao in 1620. The French Jesuit Joseph-Marie Amiot wrote a Manchu dictionary Dictionnaire tatare-mantchou-français (Paris, 1789), a work of great value, the language having been previously quite unknown in Europe. He also wrote a 15-volume Memoirs regarding the history, sciences, and art of the Chinese, published in Paris in 1776–1791 (Mémoires concernant l'histoire, les sciences et les arts des Chinois, 15 volumes, Paris, 1776–1791). His Vie de Confucius, the twelfth volume of that collection, was more complete and accurate than any predecessors. Rodrigues and other Jesuits also began compiling geographical information about the Chinese Empire. In the early years of the 18th century, Jesuit cartographers travelled throughout the country, performing astronomical observations to verify or determine the latitude and longitude relative to Beijing of various locations, then drew maps based on their findings. Their work was summarized in a four-volume Description géographique, historique, chronologique, politique et physique de l'empire de la Chine et de la Tartarie chinoise published by Jean-Baptiste Du Halde in Paris in 1735, and on a map compiled by Jean Baptiste Bourguignon d'Anville (published 1734). To disseminate information about devotional, educational and scientific subjects, several missions in China established printing presses: for example, the Imprimerie de la Mission Catholique (Sienhsien), established in 1874. In the early 18th century, a dispute within the Catholic Church arose over whether Chinese folk religion rituals and offerings to the emperor constituted paganism or idolatry. This tension led to what became known as the "Rites Controversy," a bitter struggle that broke out after Ricci's death and lasted for over a hundred years. At first the focal point of dissension was the Jesuit Ricci's contention that the ceremonial rites of Confucianism and ancestor veneration were primarily social and political in nature and could be practiced by converts. The Dominicans, however, charged that the practices were idolatrous, meaning that all acts of respect to the sage and one's ancestors were nothing less than the worship of demons. A Dominican carried the case to Rome where it dragged on and on, largely because no one in the Vatican knew Chinese culture sufficiently to provide the pope with a ruling. Naturally, the Jesuits appealed to the Chinese emperor, who endorsed Ricci's position. Understandably, the emperor was confused as to why missionaries were attacking missionaries in his capital and asking him to choose one side over the other, when he might very well have simply ordered the expulsion of all of them. The French Jesuit Joseph-Marie Amiot (1718–1793) was official translator of Western languages for the Qianlong Emperor. The timely discovery of the Nestorian monument in 1623 enabled the Jesuits to strengthen their position with the court by answering an objection the Chinese often expressed – that Christianity was a new religion. The Jesuits could now point to concrete evidence that a thousand years earlier the Christian gospel had been proclaimed in China; it was not a new but an old faith. The emperor then decided to expel all missionaries who failed to support Ricci's position. The Spanish Franciscans, however, did not retreat without further struggle. Eventually they persuaded Pope Clement XI that the Jesuits were making dangerous accommodations to Chinese sensibilities. In 1704 Rome decided against the ancient use of the words Shang Di (supreme emperor) and Tien (heaven) for God. Again, the Jesuits appealed this decision. The Qianlong Emperor, by Charles-Eloi Asselin (1743–1805) after Giuseppe Panzi. Louvre Museum. Among the last Jesuits to work at the Chinese court were Louis Antoine de Poirot (1735–1813) and Giuseppe Panzi (1734-before 1812) who worked for the Qianlong Emperor as painters and translators. From the 19th century, the role of the Jesuits in China was largely taken over by the Paris Foreign Missions Society. The Jesuits, such as Johann Schreck, translated European technical books into Chinese. Left image: a description of a windlass well, in Agostino Ramelli, 1588. Right image: Description of a windlass well, in Diagrams and explanations of the wonderful machines of the Far West, 1627. ^ Mungello (2005), p. 37. Since Italians, Spaniards, Germans, Belgians, and Poles participated in missions too, the total of 920 probably only counts European Jesuits, and does not include Chinese members of the Society of Jesus. ^ Kenneth Scott, Christian Missions in China, p.83. ^ Peter C Perdue (30 June 2009). China Marches West: The Qing Conquest of Central Eurasia. Harvard University Press. pp. 167–. ISBN 978-0-674-04202-5. ^ Susan Naquin (2000). Peking: Temples and City Life, 1400-1900. University of California Press. pp. 577–. ISBN 978-0-520-21991-5. ^ Eva Tsoi Hung Hung; Judy Wakabayashi (16 July 2014). Asian Translation Traditions. Routledge. pp. 76–. ISBN 978-1-317-64048-6. ^ Frank Kraushaar (2010). Eastwards: Western Views on East Asian Culture. Peter Lang. pp. 96–. ISBN 978-3-0343-0040-7. ^ Eric Widmer (1976). The Russian Ecclesiastical Mission in Peking During the Eighteenth Century. Harvard Univ Asia Center. pp. 110–. ISBN 978-0-674-78129-0. ^ Egor Fedorovich Timkovskii (1827). Travels of the Russian mission through Mongolia to China, with corrections and notes by J. von Klaproth [tr. by H.E. Lloyd]. pp. 29–. ^ Egor Fedorovich Timkovskiĭ; Hannibal Evans Lloyd; Julius Heinrich Klaproth; Julius von Klaproth (1827). Travels of the Russian mission through Mongolia to China: and residence in Pekin, in the years 1820-1821. Longman, Rees, Orme, Brown, and Green. pp. 29–. ^ John Parker, Windows into China, p. 25. ^ See e.g. Martino Martini's detailed account in Martini Martinii Sinicae historiae decas prima : res a gentis origine ad Christum natum in extrema Asia, sive magno Sinarum imperio gestas complexa, 1659, p. 15 sq. Wikimedia Commons has media related to Jesuit China missions. Batalden, Stephen K., Kathleen Cann, John Dean. (2004) Sowing the word: the cultural impact of the British and Foreign Bible Society, 1804–2004. Sheffield Phoenix Press. ISBN 1-905048-08-4 ISBN 9781905048083. Ebrey, Patricia Buckley. (1996). The Cambridge Illustrated History of China. Cambridge, New York and Melbourne: Cambridge University Press. ISBN 0-521-43519-6. Mungello, David E. (1989). Curious Land: Jesuit Accommodation and the Origins of Sinology. University of Hawaii Press. ISBN 0-8248-1219-0. Mungello, David E. (2005). The Great Encounter of China and the West, 1500–1800. Rowman & Littlefield. ISBN 0-7425-3815-X. Ricci, Michele; Ruggieri, Matteo; Witek, John W. (2001), Dicionário Português-Chinês : 葡漢詞典 (Pu-Han Cidian) : Portuguese-Chinese dictionary, Biblioteca Nacional, pp. 151–157, ISBN 972-565-298-3 (Detailed account of the early years of the mission). Swerts, Lorry, Mon Van Genechten, Koen De Ridder. (2002). Mon Van Genechten (1903–1974): Flemish Missionary and Chinese Painter : Inculturation of Chinese Christian Art. Leuven University Press. ISBN 90-5867-222-0 ISBN 9789058672223. Udías, Agustín. (2003). Searching the Heavens and the Earth: The History of Jesuit Observatories. Dordrecht, The Netherlands: Kluwer Academic Publishers. Wigal, Donald. (2000). Historic Maritime Maps. New York: Parkstone Press. ISBN 1-85995-750-1. Woods, Thomas, (2005). How the Catholic Church Built Western Civilization. Washington, DC: Regenery. ISBN 0-89526-038-7.